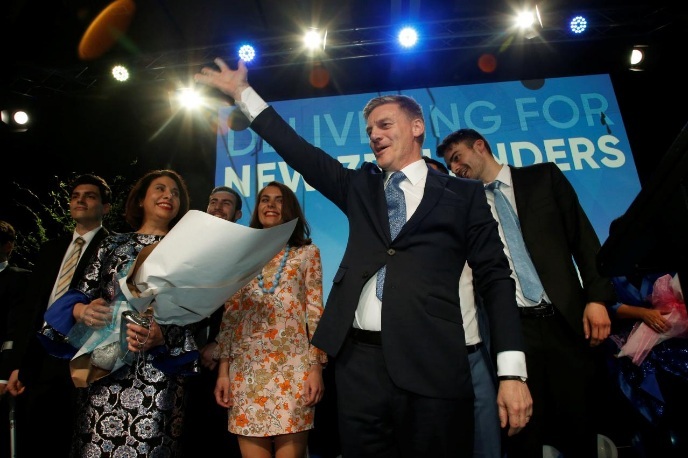 New Zealand Prime Minister Bill English waves to supporters alongside his wife Mary (2nd L) and members of their family during an election night event in Auckland, New Zealand, September 23, 2017. WELLINGTON - New Zealand’s ruling National Party took 46 percent of votes in a hotly contested election but will still need New Zealand First to form a government, the Electoral Commission said early on Sunday. The center-left opposition Labour Party had received 35.8 percent of the vote and its ally the Green Party 5.8 percent. New Zealand First was on 7.5 percent, casting the populist party as the kingmaker in the country’s German-style proportional representation system. A final tally including overseas votes will be released on Oct. 7. New Zealand’s ruling National Party took 46 percent of votes in a hotly contested election but will still need New Zealand First to form a government, the Electoral Commission said early on Sunday.